Let me get this off my chest. Proving Facebook ROI for non-revenue or non-transactional activities is not f$*** easy if you think like a CFO, however, once you get in the right mind set, it’s quite simple. It’s not easy to derive a tangible ROI from our activities because Facebook does not share the data necessary with us to do this. But it’s not like there’s no value in our activity. As marketers and advertisers, we know that we’re creating economic value even when it does not lead to a paid conversion event. We get to test brand messaging. We get to improve our brand positioning, etc…and all of that does provide value. This article will help you showcase the value of those activities to your team so that next time your CEO or CFO asks you why you’re asking for more Facebook money, you will have a great answer based on tangible calculations. Client posted a number of organic posts and videos for a product they were about to launch. One video got a magnificent number of Likes and two posts got shared beyond their normal rate. Client ran boosted posts. Got more Likes. ROI? It was huge. The new product sold off the shelves. If you consider this correlation, you’ll begin to notice it’s flawed. The conclusion that ROI was huge because of the Facebook activity may or may not be there. There might have been a series of online and offline media buys that could have lead to that. Facebook was only part of that effort. So to imply ROI from Facebook, even as an educated guess, is just wrong. From the data received from Facebook, there’s no way to tell if the campaign worked (even it the campaigns were liked by hundreds of thousands). Here’s the problem with this thought process: It’s not realistic. So, why is it so hard to measure the value of Facebook. Do we not understand what is unique about Facebook? Why do we keep looking at Reach and Online GRP equivalents to do this? It’s freaking insane! #1 Your current Facebook ROI Challenge is not that it’s not possible, it’s that that you’re thinking about based on a revenue transaction and not on Facebook’s strengths. In almost all other types of advertising today (Adwords etc), our purpose is to run an ad with the objective to find the right person, at the right time, and then target them with the right message so that they interact with my brand. For almost all non-social platform ads, you then can measure ROI by how they interact on your website or what happens offline). 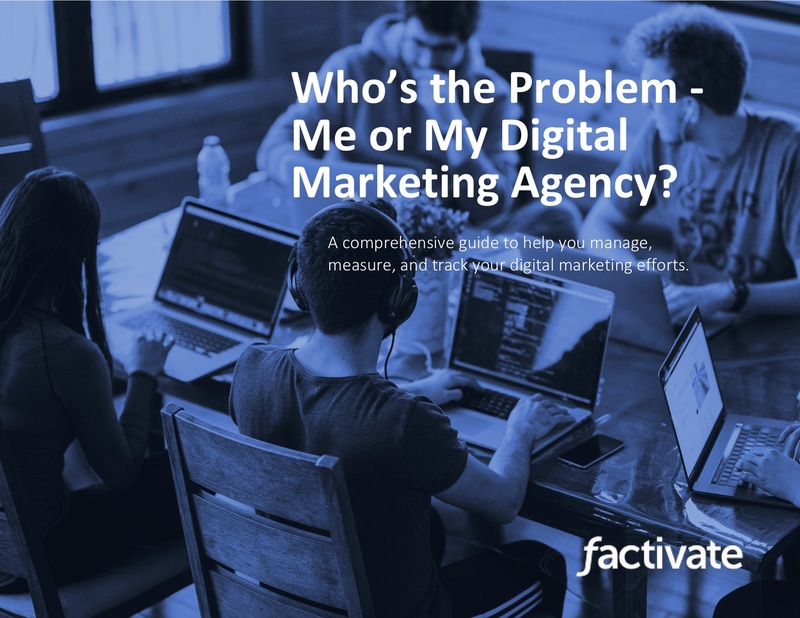 To understand your ad’s effectiveness, you’ll spend some time measuring CPCs, CPAs, CPMs, conversion rates, micro-conversions, macro conversions, etc…All of the things that directly tie to the bottom-line of your organization. But all of this changes when it comes to Facebook. LESSON 1: People don’t participate on Facebook to get people to come to our digital site. We use Facebook to engage with people, to have conversations, or to share pictures of our awesome dogs. Maybe some users interact with brands and products when it’s time for them to think about making a purchase. Maybe not. We create a Facebook brand page and spend money on Facebook Advertising to engage with this huge community. This is very different from what we’re doing with Google and other advertising platforms. You’re not pushing the audience to your digital existence. You are spending money on Facebook for an opportunity to build a community on Facebook for an opportunity to engage them (not just sell to them) for an opportunity for this audience to: 1. love you 2. recommend you to their friends and 3. remember to buy your products and services when they might need them. As a lover of insights, I believe there is value to this and I believe there is a way to measure this. BUT, it is absolutely critical that you understand that when you engage in any discussion about the value of being on Facebook and spending money on Boosted posts, the picture (ie, your goal) is substantially different than AdWords. Understanding and painting this picture if even more critical when you’re asking for higher marketing budgets. Almost all of your analysis should be spent: “get me more friends of friends to engage with my messages”. As a result, we measure likes, CTR, weekly reach, gender, CPC, and many more. Don’t get me wrong, we still have our business URL on our brand page and some people click on that URL to come to our site, BUT since your original purpose was to create an owned engaged audience on Facebook, rather than primarily driving direct revenue via constantly printing coupons/offers, it will come as no shock to anyone that the conversion rates, revenue, and bottom-line metrics from Facebook will not explain all of your value from a Boosted Post. Simply put (I’m repeating myself), that was not the point. Having a conversion business impact is not the point of Facebook. And people who try to make it the primary point have failed miserably on Facebook. If you execute only for this outcome on Facebook, you will likely achieve less than optimal success. If you’re just running traditional ads in Facebook where you: create an offer, show it to people, drive them to your online/offline existence, you are taking advantage of a huge audience. You can also prove ROI a lot easier. However, for these types of formats, you’ll end up forgetting about audience building, engagement, and utility marketing. 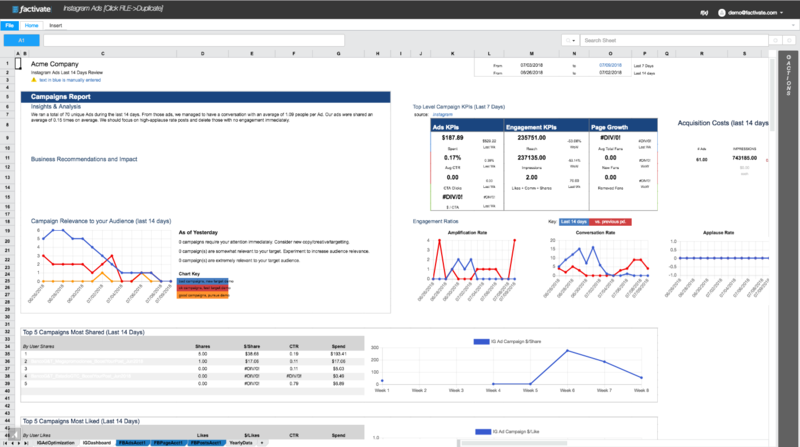 You’ll be able to measure CTR, CPC, Bounce Rates, Conversions, AOV and present this to your senior leaders. Easy peasy. But as I mentioned, this is not what makes Facebook unique. To convince your CFO and CEO that Facebook delivers value, you’ll need to prove two things. The prove value scope here is: Brand Awareness / Word of Mouth and Engagement. We use Conversation Rate, Amplification Rate, and Applause rate. This helps you sell the value of Facebook to your business. Frame it like that. An additional value scope can also be Cost savings. The number of PR people you can let go, the reduction in customer service costs, the reduced TV ads you have to run, etc…harder to prove, but if you try, you can do so. So far, it’s very hard to showcase the value of Facebook all by itself mostly becaues the execs can’t make the leap required to see the longer term potential. They spend money because everyone else does so. This is why it’s critical to get them on the same page. Prove value here means visitors to your website. 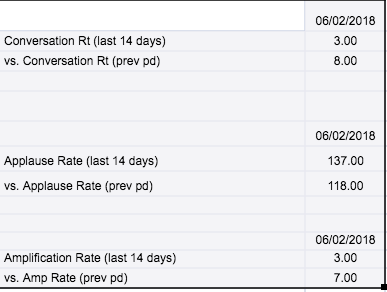 Revenue per Facebook referred visitor (considering last click attribution for now). Number of qualified leads. Number of downloads, etc…) I will go out on a limb and assume that there is no CxO in the world who does not understand the value of Facebook if you can show any of the above. Enough talk, let’s get into some awesome metrics. Did my activity (Likes, comments, shares) cause any activity of value on your Facebook presence? (Most importantly) Do all of these activities add value to your business beyond Facebook. For each Facebook campaign, we’re going to look at #1 and #2 depending on what we are trying to accomplish. Remember, the point of your ROI model is to answer the “so what” model with data. If you’re measuring Likes, so what will quickly get you off of looking at that. Reach, same thing. Same for compound metrics like virality etc. These three clean metrics answer these questions clearly. When we post on Facebook, does anyone actually engage with us via typing on their keyboards and adding to our discussion? Does anyone amplify our contribution so that it’s seen by people who don’t know about us? And, (really important!) when we post on Facebook, which content or type of content is loved by our followers/fans/friends so we can kill off the loser stuff. 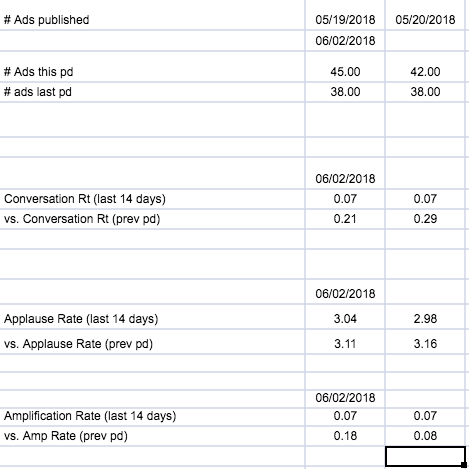 In the data below, we’re noticing that of the 45 ads released this period, our conversation rates and amplification rates are abysmal with the conclusion that: We need some serious engagement to improve it! Not great but numbers are saying some people engaged! Look at all those likes! You see how easy these totals can misguide us? The reality is that none of those ads engaged our audience. We just wasted money. We need a new strategy, don’t we? aaah…beautiful insights! Side note – we saw an agency showcase these comparisons when they were pitching a new client. The client was so astounded that they switched agencies in less than a month! Once you start looking at this data correctly, measure this over time and you’ll be able to show your management team high-value content that engages user behavior. woohooo…more people are engaging on average with our content, we’re increasing our incremental audience reach, we’re learning what messaging works better! Freaking sweet, right? Now you know the “so what”. It’s clean, you know what to fix, you know what works, and what is adding value. Now let’s dive deeper into message validation. At an individual post level think about these same metrics. Likes/Post, Shares/Post, and Comments/Post. This helps us achieve a clear page and post-level value delivered by us and what kind of engagement we get in return. Now you’ll know which content works and promote analysis rather than data puke. There is value in testing messages with large audiences and you just proved it! Whether you’re doing organic or paid activities with posts, you can now frame the argument that your Facebook brand page got more valuable via the incremental reach your activities provided. Now you’re building an owned audience on Facebook which you can then retarget with conversion-related activities if you want to. Closing thoughts: does Facebook provide value to me? This is a complex space. 1. Don’t have a social strategy. Instead, create products and services that compel social activity. At the end of the date, it’s important to remember to make your products and services so amazing that people can’t help to talk about them on Facebook. The impact of this organic activity will blow your mind. Business success can be hugely amplified by Facebook. Social media success, however, can rarely make up for core problems with your business / business strategy / products and services. Your turn now. 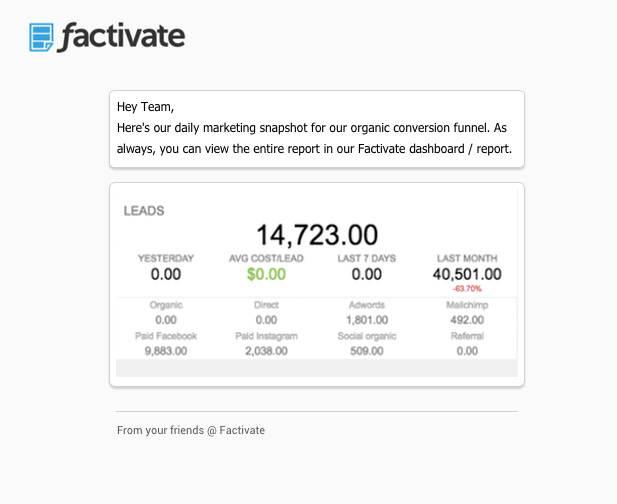 Do you use any other metrics to derive a Facebook ROI from non-paid or non-revenue conversion activities? I welcome your critique, brilliant ideas, observations, and comments.